Twister Pipe is a cool gadget for cool air. Looks awesome from the outside and acts like magic on the inside. Available in 4 different sizes to fit your needs. Twister Pipe is the high-tech solution for cool air. Twister Pipe is an innovative gadget for stoners who like it cool. 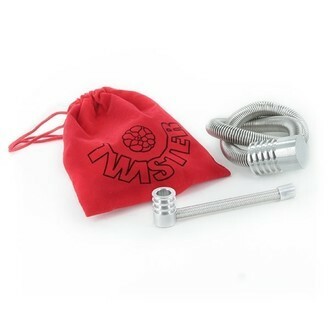 This fool-proof pipe doesn't only looks awesome, it also has a twist and does magic to the smoke going through it. Produced from finest swedish steel and extremely bendable. All parts of this pipe come apart easily without using threads. Available in small, medium, large and extra large.